If you’re a regular reader of the SotW you know that I consume a significant amount of print space exposing my readers to the buried treasures of rock music. I spend a considerable amount of my free time reading books and magazines and listening to music in order to uncover underappreciated artists and acts. Now and then I’m blown away by someone that I’m unfamiliar with and can’t quite grasp how they eluded my consciousness for so long. 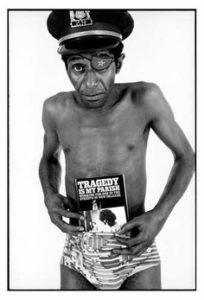 That happened to me a few weeks ago when I caught a documentary on Netflix called Bayou Maharajah: The Tragic Genius of James Booker. As at home in the church as he was amid New Orleans’ shore-leave Babylon of clubs and bars, the young Booker was also at ease with the classics as he was with R&B and pop. To Booker, it was all grist to the mill of an extraordinary musical mind, freewheeling spirit of playfulness and dazzling digital dexterity. Booker was a flamboyant character that played with everyone that’s anyone in 50s-70s rock and R&B — Little Richard, Ray Charles, Joe Tex, Aretha Franklin, John Mayall, Dr. John, Ringo Starr, Jerry Garcia, Maria Muldaur, and the Doobie Brothers among others. Booker even gave piano lessons to a young Harry Connick Jr., as a favor to his district Attorney dad in exchange for legal help he provided. Legend has it the song was a favorite of Hunter S. Thompson and was the inspiration for calling his writing style “Gonzo Journalism.” Booker himself picked up the term from the name of the character Felice Orlandi played in the 1960 crime film The Pusher. 1) Break the root note octave quite heavily into 2 notes (from the thumb down to the little finger) i.e. ba-doom jump chord ba-doom jump chord — best exemplified on say his version of On the Sunny Side of the Street. A lot of piano players will break the root octaves a bit when doing a stride piano style, mainly out of laziness etc. (it seems to make accuracy a bit easier) — but Booker’s break was really pronounced and heavy. 2) Uses a double bounce on the root and jump chord like so dum-dum (root or fifth) da-da (top chord) dum-dum (root) da-da. (top-chord) (Like doing a stride piano — in a 16ths shuffle rhythm). This style was his real trademark and he used it on his versions of Junco Partner and Goodnight Irene. Of course this style would possibly not transfer very well to a band situation!! Booker was an unbelievably colorful character. The documentary is filled with anecdotes about how he lost his eye, his bouts with addiction and mental illness, his paranoia, and many others. I don’t want to be a “spoiler” so you have to see the movie for yourself (or research him online). Sadly, Booker’s life ended at the young age of 43 in 1983. Even his death had an interesting and tragic angle to it. Apparently some unknown person put him in a taxi cab and sent him off to New Orleans’ Charity Hospital. He died, sitting in a wheelchair in the ER, while waiting to be seen. But don’t let that be the final word. Watch Bayou Maharajah and discover the full story of this obscure genius. This entry was posted in song of the week, tom and tagged Gonzo, James Booker, On the Sunny Side of the Street, song of the week. Bookmark the permalink.